Shimano style downtube adjusters. Internal spring, fits most standard integral road-frame stops. Also immensely useful to replace broken adjuster screws on rear mechs. M3 thread with spring and domed nut. This gets fitted from the inside of the drop out with the spring over the thread. The domed nut goes on the outside to allow manual adjustment. This was invented for racing to allow a quick and accurate wheel change. Virtually all racing frames used to feature this device before vertical drop outs became the norm. 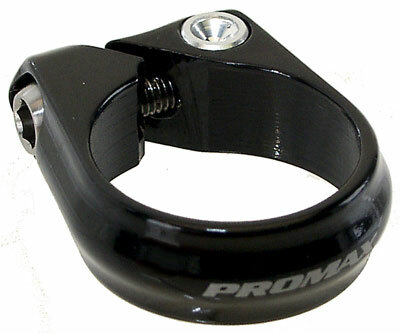 Front mech clamp with polypropelene insert. Use with front mechs for braze on fitting on frames without. Insert reduces clamp from 34.9 mm to 31.8 mm. 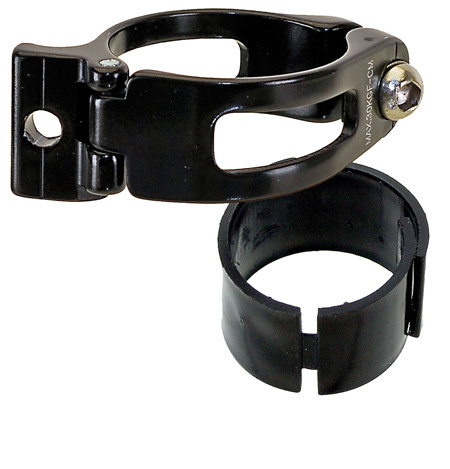 Very neat light weight clamp, black anodised only. 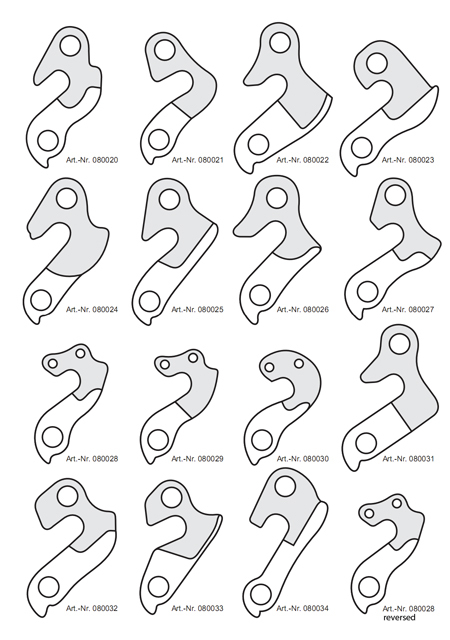 Are you frustrated by trying to find the correct hanger for your frame? There seem to be a bewildering variety of them out there. Here's a selection of the most common ones. To help you find the right one, download this pdf file with outline in original size. 080028 (reversed), DISCONTINUED 080028 (mirror) also available with plate on inside of frame, not pictured. Seat clamp with hinged nut to prevent bolt from snapping. Chamfered inner edges, ideal for carbon posts, operates with M5 allen key. Allen bolt rust protected. Currently finished matt black. 31.8 mm, 17 grams.